Regulated Plant is defined by the OHS Regulations 2007 (Vic), and includes many items of powered machinery and devices, and some vehicles. Regulated Plant must be managed in accordance with Health & Safety: Regulated plant requirements. A Health & Safety: Plant register and a plant risk assessment form should be filled out where required. Non-regulated plant should be managed in accordance with general risk management requirements. Refer to Implement section on the Management System page. The University of Melbourne publish several guidance materials which promote the correct use and management of electrical equipment. In October 2015 the scheduled inspection and testing of portable electrical appliance plugs (arranged by Campus Services) began recording uninsulated pins identified during the inspection. From early 2016, in addition to the electrical testing tag, a tag indicating that the lead has uninsulated pins will also be attached. The purpose of this tag is to identify to the local area that a lead has uninsulated pins. The tag does not indicate that the portable electrical appliance is unsafe for use. Plan and prioritise the eventual replacement of uninsulated plugs based on level of risk. Danger tags and lock-out devices are used for isolating equipment during cleaning, servicing, repairing or alteration, as described in Health & Safety: Isolation, lockout and tag out requirements. A sample illustration of the danger tags used by Campus Services. Danger tags and lock-out devices should be supplied by the person completing the work. Danger tags should not be confused with Out-of-service tags (below). 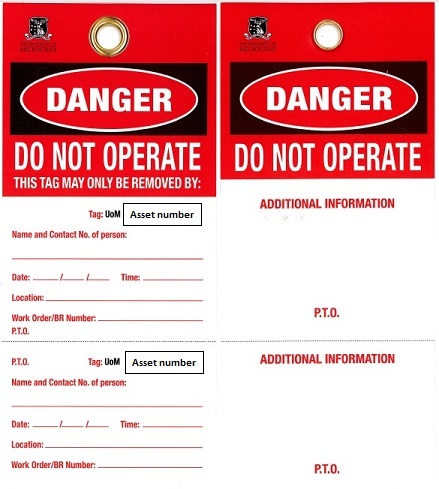 Out-of-service tags are tags are used to withdraw unsafe plant and equipment from service, as described in Health & Safety: Unsafe plant and equipment requirements. An example of an out-of-service tag. 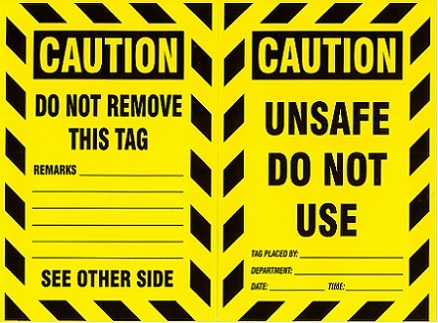 Out-of-service tags printed on UV-resistant vinyl are available by contacting Health & Safety. Note: it is not compulsory to use this particular design of out-of-service tag. You can use any design that complies with the specifications in the OHS procedure. Out-of-service tags should not be confused with Danger tags (above). We ask that Schools and Departments ensure that up to date information about each pressure vessel they own or control has been passed onto the preferred external consultant, Frank Busch Inspection Pty Ltd. The consultant runs scheduled inspections for all registered pressure vessels across Schools, Faculties and Departments within the University. These inspections are in line with AS/NZS 3788. At certain times there may be an opportunity for departments to access a group servicing contract for autoclaves. Please direct queries to your local health and safety Business Partner.